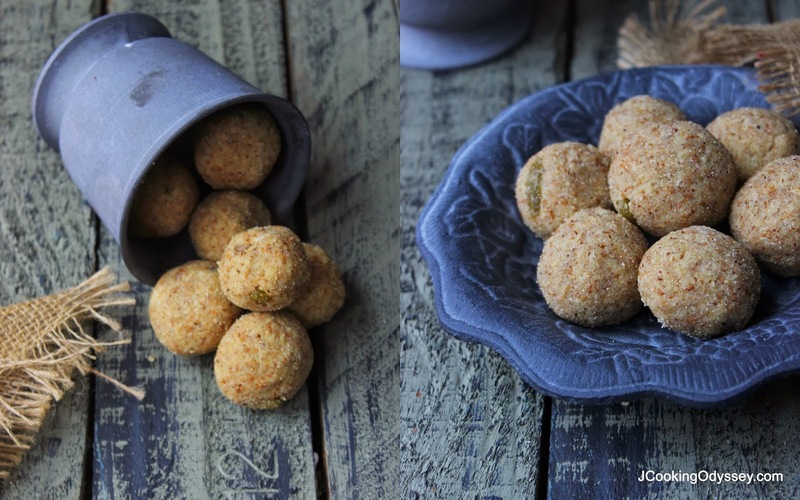 Jagruti's Cooking Odyssey: Broken Wheat & Flax Seeds Ladoo - Gehun Daliya aur Alsi ke Ladoo - Ghaun na fada ane Alsi na Ladwa - Winter Warmer Delight ! 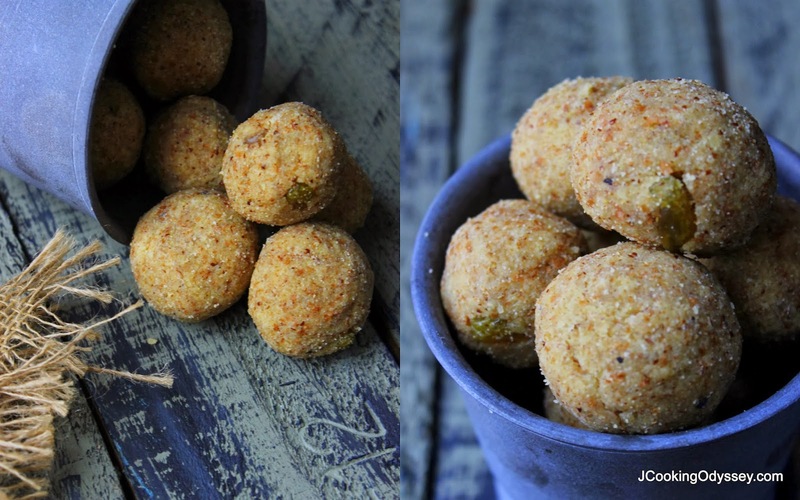 Broken Wheat & Flax Seeds Ladoo - Gehun Daliya aur Alsi ke Ladoo - Ghaun na fada ane Alsi na Ladwa - Winter Warmer Delight ! My phone conversation changes on the phone just like season changes, especially with my dad. Mostly we do talk about health, weather and food, in my last conversation we ended up talking about harsh winter in India and how people manage and survive through winter warming food. I reminded him how my mum used to prepare some special type of winter delights ( we Gujarati call Paak ) which are packed with various nutrious value. Winters can be very hard to survive in any country, and it has a direct impact on our health because of cold and short days our outdoor activities become less and less. Many of us struggle to fight cold and often complain about aches and pains during this season. We always look out for any type of solutions to keep ourselves warm. Although nature has its own way of keeping the body warm, we are still dependant on other things. Many of us who can afford it, first thing first we think about Central heating system in our homes, second from food which generates heat and raises the body's temperature, helps us to cope naturally. Certain foods have a more warming effect than others, Known as "Diet induced thermogenesis", this effect is due to energy released during digestion and assimilation. In winter it is advisable that we should consume bajra ( millet ), Oats, and corn besides rice, wheat and whole pulses and legumes in grains and pulses category. To fight cold, coughs and sinusitis, winter is an excellent time to incorporate lots of ginger, garlic and whole spices like cinnamon, cloves and peppers, not only have warming effects but it helps to fight infections and diseases. And alongside all these food, most popular eaten foods are Nuts, Seeds, Honey and Jaggery especially amongst Indian community. Nuts and seeds are nutrition packed for harsh cold days and honey and jaggery has naturally warming effect. Lots of vitamins and good fat is the best fuel for our body. During winter in most of the Indian kitchen ladies start preparing these unique winter recipes, however I do not prepare as much as we used to prepare in India, but can not resist in small amounts. So while I was talking to my dad we talked about various dishes which you can prepare, also I told him about how my mum used to prepare, will share that recipe some other time as that recipe needs some special ingredients which I didn't have this time in my kitchen. A recipe I am going to share with you which my dad's aunt used to prepare in Nainital, India, which has similar weather to Europe. In those days no one has heating system in their homes, best way to survive in harsh and deadly winter was keep eating warm food and keep warm by huddling around open fires or small bonfires. 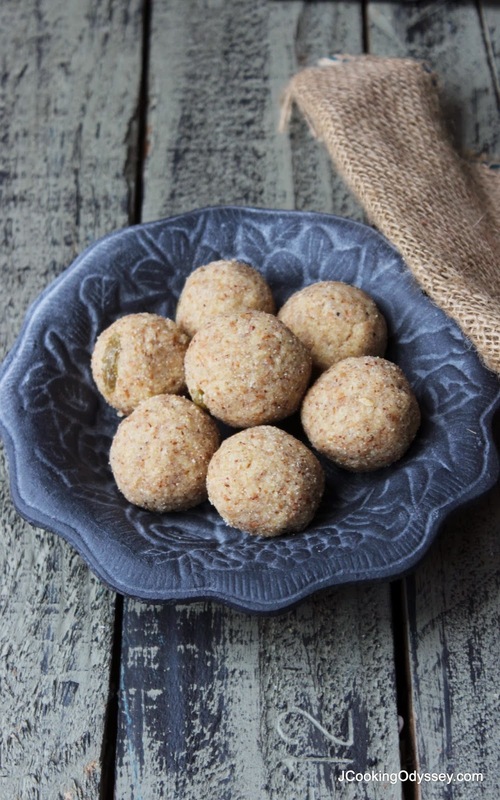 Broken Wheat and Flax seeds Ladoo, is a traditional and healthy delight if eaten during winter. According to Ayurveda flax seeds helps in reducing cold, cough, acidity and pain in joints. Also it has more nutritional value than almonds and walnuts, only cheaper ! Broken wheat is good source of iron, low GI values, and more fibre, vitamin and minerals than AP flour. So in my todays recipe we have nothing but only full of goodness. Best of both worlds :) , exceptionally good for you if eaten in small quantity and little bit of exercise done as well !!!! Clean, wash and soak broken wheat for 4-5 hours. Meanwhile roast flax seeds on a low heat, you will hear some crackling. Roast 5-6 minutes, let it cool and grind it in a grinder to coarse powder. Dry roast wheat flour without any ghee on a low heat till raw aroma goes away. ( it will take 8-10 minutes ). Leave it aside. Drain all the water and leave it in a sieve to get rid of extra water. Add soaked and drained wheat, roast them on a very low heat. Now in another pan heat 2 tbsp. ghee, add grated jaggery. Let jaggery melt, keep on a low heat , you can see jaggery melt and bubbling away. As soon as syrup gets frothy turn off the heat. Add syrup into roasted broken wheat, Flax seed powder, add chopped nuts sultanas cardamom and nutmeg powder. Take lemon size of mixture and make into balls, if needed add more flour. Make all the balls from the mixture. Let it cool and store in air tight container. Enjoy them every morning with hot glass of warm milk. wow these are very new ,they sound healthy. These look so delicious. With I can reach out for them.